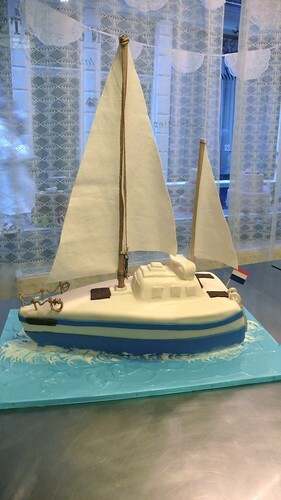 3D Sail Boat Cake, a photo by CAKE Amsterdam - Cakes by ZOBOT on Flickr. Groom's Cake for a wedding order... secretly ordered by the bride. Wedding date on the little board at the bow of the boat and at the back... an American flag and a Dutch flag with the name "My Little Pearl"
FLAVOR : Coffee syrup soaked chocolate cake with coffee mocha buttercream.